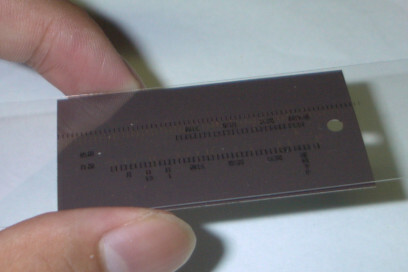 This record format have been used in organizations that use an automatic ticket checker from early on. Record density is rough, so we can analyze the data by the naked eye. The line A is called "other line track". In the case of a ticket which can board to the station of a different railway company, other company related data is recorded into this track. The line B is called "own line track". And own line related data is recorded into this track. I exhibit a ruler for analysis. When analyzing NRZ regular ticket, I use it. Please print (copy) this PDF file on an OHP sheet. And put it on a ticket which is sprinkled an iron powder (refer the following photo). This ruler has a quite thin line. So it recommends using a laser beam printer.